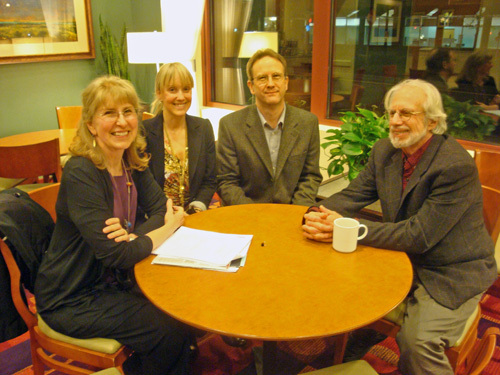 Dr. Feinman, founder of the Nutrition and Metabolism Society, invited me to join him and two other Northwest NMS members for a brainstorming session in Portland a little over a week ago. D offered to drive me down, so we put on a CD of Bluegrass music and took the day off for a much-needed mini-vacation. That’s me, Dr. Ann Childers, Dr. Peter Ballerstedt, and Dr. Richard Feinman in the picture above (left to right). I was thrilled to meet Dr. Ann Childers, a child and adult trained psychiatric physician who helps her patients regain their physical and mental health naturally through nutrition and sleep. Her website is: http://annchilders.blogspot.com/2011/01/butter-up-buttercup.html. And Dr. Feinman, a bigger-than-life hero in the low-carb community, is always a joy to talk with. I try to do more listening than talking, since he is a brilliant scientist as well as an articulate spokesman and activist who is passionate about changing the conventional wisdom of the medical establishment that has undermined the health of our nation. Check out Dr. Feinman’s new blog at: http://rdfeinman.wordpress.com/. Dr. Ann Childers, Dr. Peter Ballerstedt, Nutrition and Metabolism Society. Bookmark. I'm really looking forward to reading your blog, but the font is so teeny tiny and high contrast I'm going cross-eyed trying. Some of us who could use your information have a problem and need a bit larger print. Just a selfish suggestion so I can glean your wisdom here! It's not selfish at all; I totally understand. However, I'm not always in control about how my posts show up. Blogger.com sometimes seems to have a mind of its own. It's probably something I've done wrong in the past that messed up the system. I do plan to start fresh as soon as I have time to work on it. That said, I will try to make the font larger on this post and see what happens. Check back, and if it is still the same, at least know that I tried. I'm also planning to choose a different color background or font to reduce the contrast. I've had complaints about that before. Hi arlene….use Ctrl + to make page font bigger in Firefox or the Icon on bottom right on IE.